Apparently you need a movement to get Americans to understand that diesel technology has vastly changed since the days of great, but stinky cars like a 1984 Mercedes 300 Turbo Diesel. Audi is the one leading the movement with their new campaign “Truth in Diesel”; a variation from their multi-year brand campaign “Truth in Engineering”. Before we get into the “movement" and its merits, let’s first discuss what perception Audi is trying to change and why a movement is even necessary. 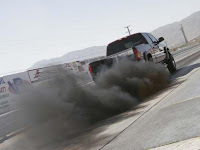 We Americans think of foul-smelling public buses and interstate 18-wheeler semi trucks spewing gobs of black smoke when we think diesel. I had a neighbor recently who owned an early 1990s Ford F-250 diesel that he would run a remote starter on during the winter months in Michigan. In Birmingham, where I live, the homes are very close – think forty-foot wide lots right smack next to each other. Well the smell from the neighbor’s diesel truck would leave a lovely odor in our home after about three minutes of the truck running. My wife hates, hates diesels because of this neighbor. She is the perfect person that needs convincing that diesels of today have changed and hence diesel’s perception issue is now Audi’s issue as they launch the diesel Q7 and A3 vehicles. One of the great things about my experience on Twitter is finding advocates out there who really live their passion. One such person is Daniel Gray (follow him @mpgomatic) who runs MPGoMatic, a blog about cars and the energy they use. Daniel wrote an excellent article asking if there is an anti-diesel conspiracy since so much of the automotive press ignores diesel as a viable way to gain better MPGs in today’s cars. For some reason, diesel gets no respect from journalists either; though, the article does mention some positive coverage of the VW Jetta TDI which got through the clutter. Audi’s movement must address the diesel bias that still permeates most fuel efficient discussions. So what makes up the Audi “Truth in Diesel” campaign? A website, of course, and some TV spots that show rolling oil barrels returning to the oil tankers that bring them to the US shore. 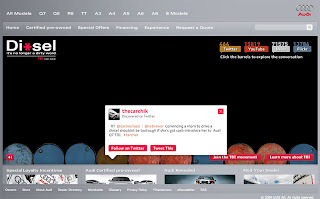 The current home page of the Audi USA site prominently features the video and the new campaign. So much so you wonder if it is distracting shoppers interested in other Audi vehicles? The Diesel: It’s No Longer a Dirty Word page features a Join the Conversation message that features all of the “conversations” going on across Twitter, YouTube, Blogs, and Flickr. Here you can click on oilcans that show a popup where you can read a Tweet and even “Tweet This”. Its your typical search a keyword feed pulling “Audi + Diesel” terms from various open social network sites that then display how you are connected to the “conversation” going on in cyberspace. Once you get beyond the social media oilcans, there is a very rich site that includes some demonstration videos showcasing the Turbo Direct Injection (TDI) diesel engine with a stodgy voiceover; I guess that’s luxury education for you. Not very engaging, but informative. You can also explore “The Truths” which are various facts about better fuel choices and how diesel is an excellent decision for green consumers. Fuel economy savings, impact on environment when fewer fossil fuels are used, and less dependence on foreign oil are the key messages in the Truth campaign. We Want You to Join the Movement By Us Donating a Dollar, Huh? 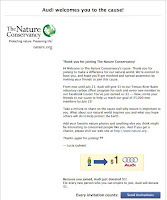 It’s a nice link between fuel economy and supporting a green organization like the Nature Conservancy. Unfortunately, joining the cause in Facebook brings you to a donation play that does nothing to help people understand and promote the improvements in diesel technology which is what the Audi campaign is really about. Nothing is really wrong with the charitable cause approach, except it misses the real point, which is educating the world about clean diesel and what the new technology has accomplished. Just seems to me someone in campaign brainstorming said hey we are doing something Green and we want to be on Facebook so maybe we should do one of those cause thingys since they're so popular. What is still missed, however, is how the new diesel isn’t the diesel of old and this message is still lost in all of the positive fuel benefits. I think most know, especially higher income Audi consumers that fuel benefits exist when going diesel, but they are still not educated on how diesel is cleaner in today’s new engines; hence, perception change is lost in the campaign. This all brings me back to my wife and her hatred for the diesel truck next door. I asked her if she would buy a diesel Audi Q7, a SUV I know she likes, though the non-diesel version. She said, “whenever I see a diesel car; I wonder why they would drive diesel? Just to be different?” What she considers confusing is why drive a stinky car and one that’s gas usually costs more than non-diesel fuel. Neither of these issues are addressed by the Audi campaign, at least yet. We do learn in the Wall Street Journal article about the campaign that what is out now is phase one of the campaign. Hopefully phase two addresses some more pressing concerns. I think Daniel is right. Whether the Audi “Truth in Diesel” campaign speeds up that acceptance remains to be seen, but I hope it does. The new diesels are not the diesels of old and they should be considered part of America’s move to more fuel-efficient vehicles.